Premier pecies marked Schneider. Less expensive designs sold as Le Verre Francais or Charder. Engraved with stylus is typical between 1918 & 1939. 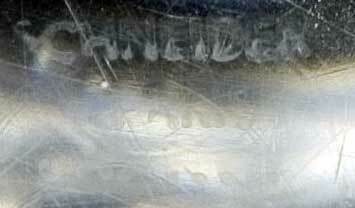 Up to 1924 incised signature could be touched up with gold. Painted in red enamel between1918-1922. Between 1924-1928 signature was a combination of wheel engraved straightlines stylus engraved curves on some pecies. Other variations on the signature include the addition of a minature red, white & blue cane a few mm long embeded in the side of the glass. Usually used on Le Verre Francais or Charder pecies, sometimes alone. The addition of a tiny cross of Loraine is sometimes seen. These appeared following WWI & WWII. Born 1895 in Rumania. In late 1890Õs established a glass & jewellery workshop in Munich. Was artistic director of Grossherzoglichen Hessischen Edelglasmanufaktur in Darmstadt between 1907 & 1911. Company originally set up under patronage of Ernst Ludwig, Grand Duke of Hess. He continued painting, sculpting & designing until his death in 1949. See encyclopedia. 1907-11 Gold iridescent glass with floral or swirled patterns. Simple clean lines. Paper label on some early pieces.